Earlier today we brought you news of Google Drive, the new cloud service that was finally launched yesterday. Now we thought it was time to see how Google Drive stands up against competition such as iCloud, Dropbox and SugarSync, with a brief overview of services and a price comparison. Since the launch of Google Drive yesterday it has become apparent that rivalry in cloud provision is really stepping up. We’ve already given you plenty of information and details of how to get started and an app so check out our previous article at the link for more on that. Drive can be installed on Windows PCs or Mac with an app for Android devices now and an iOS app to follow. As well as the reveal of Google Drive, Dropbox (probably the main contender up till now), has also released an updated iOS client and added new features making content easier to share content via direct links that anyone with a browser can look at, regardless off whether they have a Dropbox account or not. Dropbox is available for Windows, Macs and Linux and also supports the iOS, Android, and BlackBerry OS mobile platforms. Another feature that Dropbox offers is Dropbox for Teams. For the first five users it costs $795 yearly and provides 1TB of shared cloud storage. Of course Apple’s iCloud service also has a strong foothold in the market offering storage for those who have an iOS device running iOS 5.0 or later or a Mac running OS X Lion 10.7 or later. You do need one of these devices to open an account though, which is where it differs from other storage providers and the focus is on syncing between your Apple devices and apps. 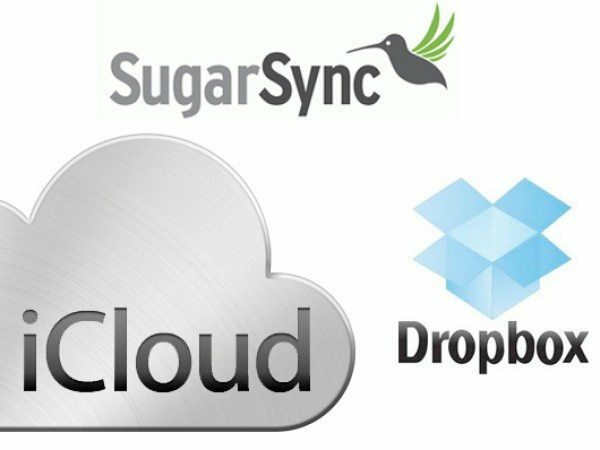 SugarSync is a California-based company that combines many of the better features of Dropbox and also Microsoft’s SkyDrive. SugarSync has also come up with a new iPad app that offers advanced features and bills itself as offering advanced capabilities over other cloud services available and supports a wider choice of mobile platforms. We’ll now take a look at how pricing compares and have used details from iDownload blog for some of the information here. All four of these cloud storage providers offer varying amounts of storage free. Google Drive pricing is free for up to 5GB, $2.49 monthly ($29.88 yearly) for up to 25GB, $4.99 monthly ($59.88 yearly) for up to 100GB and there’s also a $49.99 monthly option ($599.88 yearly) giving users up to 1TB of storage. For Dropbox up to 2GB is free and then it will cost you $99 yearly for an extra 50GB (ie 52GB in total) or $199 yearly for an extra 100GB. Turning to iCloud users get up to 5GB free and then it costs $20 yearly for an extra 10GB, $40 yearly for an extra 20GB or $100 yearly for an extra 50GB. Finally we’ll look at SugarSync offering up to 5GB free, up to 30GB for $49.99 yearly, up to 60GB for $99.99 yearly or up to 100GB for $149.99 yearly. As you can see then, Google Drive looks pretty good value. Pricing options shown are not necessarily all the options available but enough to give you some idea of how prices compare from service to service. What are your thoughts on Google’s new Drive service? Will you be using Google Drive or do you think your current cloud storage provider has more to offer you? Send your comments to let us know.